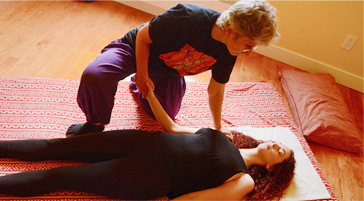 I have been working as a shiatsu massage therapist since 2003. I see my role as that of a facilitator that helps you access your own healing process, whether physical or emotional. I have a strong interest in the link between body and mind. I also have a keen interest in dream analysis according to the ideas of C.G.Jung. But let's go back a little. My interest in alternative therapies started a long time ago when I was training as a biologist in Geneva, Switzerland. Among all the courses I took at university, there was one that really stood out: medicinal botany. My interest in the healing properties of plants and in alternative therapies has continued ever since. My journey as a professional therapist started in 1999 with a Reiki training. In 2003, I qualified as a Shiatsu therapist from the Aberdeen School of Shiatsu (formerly Aberdeen College of Shiatsu) in Scotland. After practicing for many years in Aberdeen, I moved to Montreal in 2011. I practice in the Saint Henri area, where I have my own space. This allows me to offer you in-depth healing and relaxing treatments, personalised to your specific needs. Besides the healing arts, another of my passions is creating works of art: painting, drawing and digital images.